Little Rock (LR) women’s volleyball fell to Saint Louis (SLU), three sets to one Saturday afternoon in St. Louis. This was the second match LR has played at this week’s Billiken Invitational. 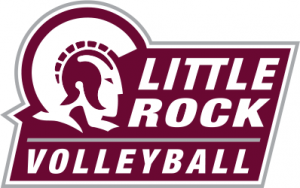 The Trojans swept there first match against Louisiana Tech Friday night. SLU (2-10) claimed its sets by scores of 25-21 (twice) and 25-23. The Trojans (4-7) won the second set of the match, 25-20. LR junior Taylor Lindberg had 38 assists, the most of any player. The total was also Lindberg’s fourth-best performance of the season, as she had a three-match stretch from Aug. 26 to Sept. 1 in which she posted 52 (Southern Miss), 45 (Central Arkansas) and 39 (UT Martin) assists. Lindberg currently averages 9.4 assists per set. Senior Marina Avram led the Trojans with 15 kills, 14 digs and four aces. LR had 12 blocks, compared to the Billikens’ five. Veronica Marin was responsible for six blocks, while Lindberg and Maritza Mesa both had four. SLU had a pair of players with 16 kills each, Maya Taylor and Monica Loftus. Lauren Leverenz had five aces and five blocks for the Billikens, while Camilla Rivas logged 30 assists. The Trojans will conclude their participation in the Billiken Invitational with a 4:30 p.m. matchup against DePaul.